The carpets in our homes, don’t stay clean for very long. Especially in the high traffic areas, like the hallways. That’s why cleaning them on a regular basis is so important. Not only will frequent cleaning make them look brand new, but it will help to reduce the toxins and pollens that can make your family sick. The problem is that the commercial carpet cleaning solution that you use to clean your carpets are full of harmful chemicals and toxins that can make your family even sicker. 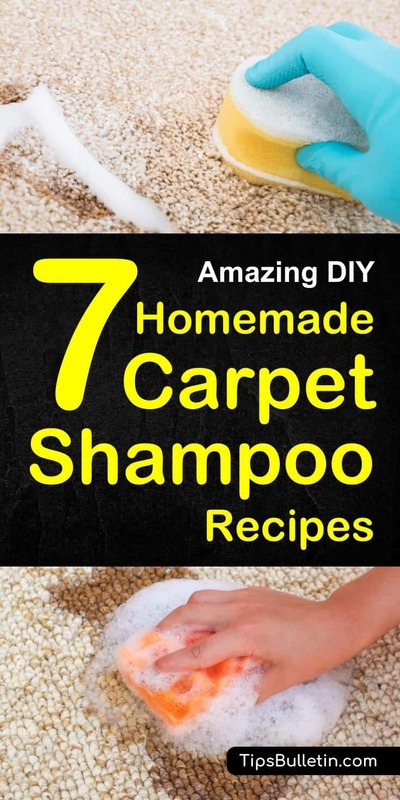 That’s why you should consider making a DIY carpet shampoo the next time you need to clean your carpets. Making a homemade carpet cleaner is an easier and more environmentally friendly alternative to using the commercial carpet cleaners that you find in the store. All of the recipes here use common household ingredients that you probably already have in your kitchen. Here are several excellent homemade carpet cleaning solution recipes for cleaning your carpet and getting rid of unsightly carpet stains. Synthetic or human-made fibers make up the majority of the wall-to-wall carpet market and are popular due to their strength, durability, stain resistance, and affordability. The maintenance of synthetic carpet fibers is relatively simple, making this the perfect homemade carpet cleaner recipe for your floors. In a large bucket, mix the ingredients until well combined. Add the solution to your carpet cleaning machine. Following the machine’s manufacturer’s instructions, begin cleaning your carpet. Be sure not to get your carpets too wet as it will ruin the backing and cause the carpeting to shrink. This recipe uses hydrogen peroxide as its base ingredient, along with warm water. The hydrogen peroxide provides extra lifting power for tough carpet stains, along with a diluted whitening power. This recipe should not be used on darker colored carpeting as it will lift the color and leave a white spot on your carpet. As with any of these methods, it’s crucial to spot test the cleaner on an inconspicuous area of your carpet. Mix the hydrogen peroxide, dish soap, and essential oils in a small bowl. Stir thoroughly to ensure they are combined. Pour the mixture into your carpet cleaning machine’s water reservoir along with the hot water. Use the carpet cleaner and be sure to follow the manufacturer’s instructions. If you use a steam cleaner to clean your carpets, you don’t have to continue to use the recommended, harmful professional carpet cleaning solutions. Here is a great recipe that you can make at home to use in your carpet cleaning machine. The great thing about this recipe is that it uses inexpensive ingredients that won’t leave a toxic residue on your carpets. Using an empty gallon-sized milk or juice container, combine the ingredients. Fill the rest of the container up with warm water. Add the solution to the reservoir of your carpet cleaning machine. The mixture isn’t concentrated so you won’t need to add any additional water to the tank. 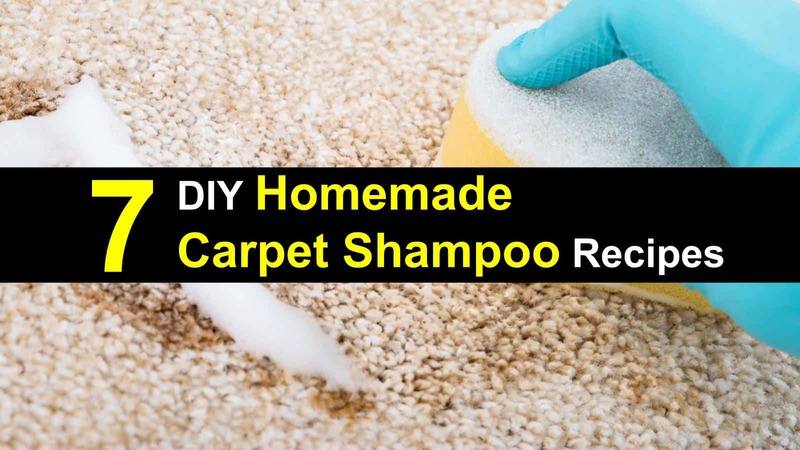 This homemade carpet cleaning solution not only does a great job cleaning your carpets but can be used to mop your floors and cleaning your bathrooms. When you have pets and kids in your home, your carpet can quickly look dirty and dingy. Unfortunately, using the commercial carpet cleaners on the market can end up leaving toxic chemicals behind that can leave your family feeling ill. This DIY carpet cleaning spray is easy to use and will leave your carpets free of dirt and stains. It is often used to clean car carpet and other more rigid mats. Add the water and vinegar to a spray bottle. Add the essential oil and the salt. Place the cap back on the bottle and shake thoroughly. Spray the solution on the carpet. Shake the bottle frequently to ensure the liquid stays mixed. Allow the carpets to dry to ensure that the cleaner has time to work. Vacuum the carpet to remove the cleaning residue. This simple carpet cleaning recipe is also the base for various easy-to-make upholstery cleaner. Many of the popular commercial stain removers on the market often have large labels explaining how they use “enzymes” to break down stains and odors. Here is a recipe that you can make yourself to do the same thing. It is part of our DIY carpet stain remover recipes here. This method takes a bit of time and patience to make, but once it is ready, you’ll wonder why you hadn’t been doing this all along. Add the brown sugar to the container. Place the lemon and orange peels in the container. Next, pour the water into the container, and tightly screw the cap back on. Shake the container to mix the ingredients. Next, you will need to loosen the cap, leaving it halfway on. Doing this will allow the gases that build up to be released to ensure that the bottle doesn’t explode. Let the mixture sit for three months. After three months, pour the liquid into a spray bottle and spray directly onto the stain. With a clean, dry cloth, pat the area gently. Let the area dry, then vacuum to pull up the residue and dirt. Animals tend to be hard on our carpet, making this homemade pet stain and odor remover spray a must. It is inexpensive and easy to make and will work to get urine and blood stains out of the carpet. The white vinegar will get rid of even old stains that may have been overlooked, while the baking soda works to remove odors. Mix the ingredients thoroughly and add to a spray bottle. Carefully blot the area that needs to be treated to get up as much of the liquid as you can. Spray the area with the solution and let stand for 5 minutes. Gently rub and blot up the liquid with a soft cloth. Allow the area to dry. Since this odor remover is used as a spray, it can also be used as an easy to drying car upholstery cleaner. Just spray your car seats light and use a vacuum cleaner to remove any residues. Hydrogen peroxide is a great ingredient to use when it comes to breaking down urine and pulling out stains. When you combine it with baking soda, you can eliminate odors as well. When these two ingredients are mixed, you have another great solution for getting rid of carpet stains. Using paper towels or clean cloths, soak up any excess liquid from the carpet. Sprinkle the soda over the stain. Mix the hydrogen peroxide and dish soap in a bowl. Slowly pour the liquid over the baking soda and stain. Using a soft brush or cloth, rub the mixture into the carpet. Allow sitting for 10 to 15 minutes. Vacuum the area thoroughly. Repeat for tough stains. Alternatively, use diatomaceous earth and rub it into the carpet stain. After a couple of hours, it will eradicate the stain. Might need several applications. Having clean carpeting that is free of stains and odors without using products that contain harsh chemicals is possible. These seven recipes are easy to make and won’t cost you an arm and a leg. They use everyday household products that are safe for your family, and that are environmentally friendly. We hope you found the information in this article helpful and will share it with your family and friends.